Some of your devices are very personal. Your iPhone, for example, is a device that you carry around with you most everywhere you go. Your Apple Watch, if you have one, is even more personal, since you wear it much of the day. But for many people, an iPad is a shared device. Many families have an iPad they leave in the living room, or have one for the kids, and this can lead to problems ensuring that its data is secure. Or a parent may have an iPad that they lend to a child for a while, but there's a risk that the child may access or delete some of their personal data. Unlike the Mac, iOS doesn't allow you to set up multiple user accounts on a device. Here's why it needs this feature. When you set up an iOS device, you are prompted to enter your Apple ID. This in turn activates features such as email, iMessages, calendars, notes, and more. You can turn these services off, if you want, in Settings > [your name] > iCloud. You also need to use an Apple ID for the iTunes Store and App Store, and this is a separate setting (Settings > iTunes & App Store). If you're setting up a device to be shared with your family, it's a good idea to check these settings to make sure that none of your personal user data is accessible. But you do need at least one Apple ID set up for apps and other content. The above scenario is fine if you have a device you can dedicate to be shared, but what about when an adult wants to share their device temporarily with a child? My partner has a three-year old granddaughter, and she sometimes allows the child to use her iPad. But that iPad is set up with my partner's Apple ID, allowing access to email, messages, and all the other personal data on the device. Little kids are digital savvy, and know that they can tap in lots of places to make things happen. They could tap on the Mail icon, for example, and perhaps open an email and send it to some random contact. They could delete calendar events and notes. Or they could send or delete messages. In addition, they can easily go to Netflix or Amazon Prime Video and view content that you don't want them to see. 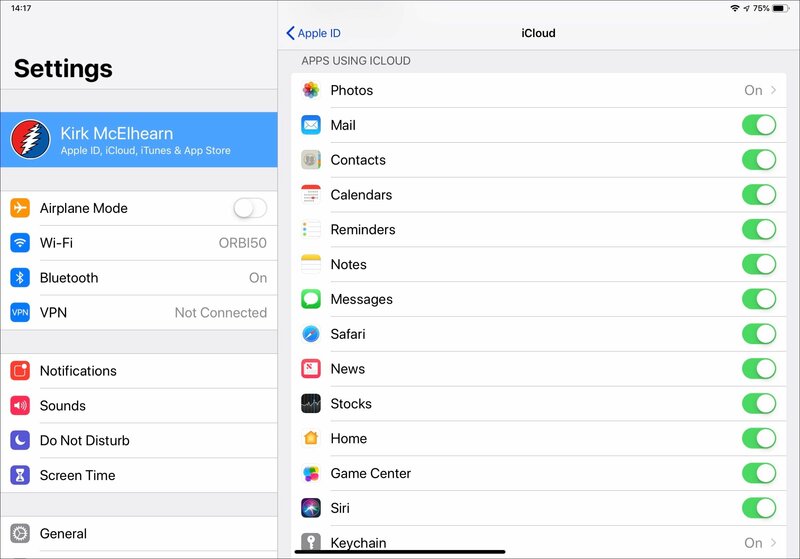 If Apple allowed multiple users on iOS, then my partner could set up the iPad with a second account when the child wants to use the device, and not have to worry. There are several ways Apple could do this. The first is to allow nominative user accounts. The advantage to this is that you could set restrictions that are appropriate to the child's age for each account. And if you could do this for multiple children, then you would be comfortable that each child using the device would not be able to use it in ways that you don't approve or intend. The other option would be to create a general guest account, such as on the Mac, which has a set of default settings that you could adjust. This account would not be nominative, though Apple would have to allow you to set an Apple ID for the iTunes Store and App Store. The problem with this is signing into apps that provide content, such as Netflix; there would need to be a way for those apps to use the credentials signed into the main user account. Finally, there could be a Children account by default in iOS that you could create, or activate, which retains all your login details for apps, yet limits the activity that users can perform. Again, Netflix is a good example of this. It allows you to set up profiles for different users, each of which retains their own settings, watch list, etc., and each profile can have a maturity level. 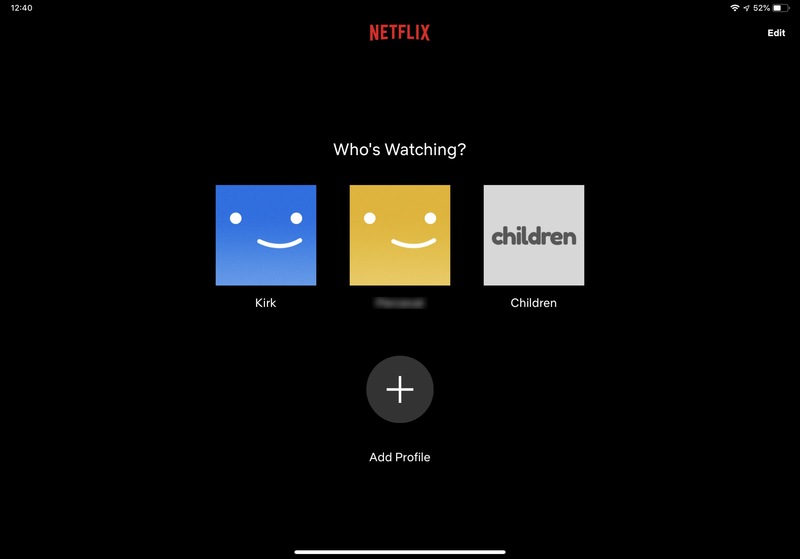 In addition, there's a default Children profile (called "Kids" in the U.S. Netflix) that you can use at any time, so kids only see appropriate content. It's worth noting that Apple already allows this for educational users. Teachers can set up accounts for all their students, and each one logs into any of a number of shared iPads to their specific profile. So the technology for multiple iOS user accounts already exists—just not for families. This solution does require a server, but Apple could build a multiple user management system into HomeKit, for example, which allows you to use an iPad, Apple TV, or HomePod as a home hub. Multiple user accounts on iOS would make it much easier to share devices, especially in families. Apple should implement this feature to help users better control what their children see and do on iOS devices. 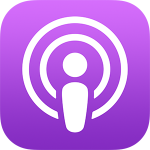 We'll have an in-depth discussion of iPad topics on this week's episode of the Intego Mac Podcast, so be sure to subscribe to make sure you don't miss the latest episode. You'll also want to subscribe to our e-mail newsletter and keep an eye here on The Mac Security Blog for updates. This entry was posted in Apple and tagged iOS, iPad, User Accounts. Bookmark the permalink. Multiple accounts imply separate storage, memory and sandboxed account spaces and application state context for each user profile. Is the current storage limits on current iPads and the current sandboxing environment, etc. conducive to multiple accounts? iOS shutdowns and saves the current state of apps that are no longer in “active” context. How will this affect user expectations, given user expectation that apps on iOS are expected to be in the state the user left them? Apps on macOS can save state to disk when a user profile is dormant. > It’s worth noting that Apple already allows this for educational users. Teachers can set up accounts for all their students, and each one logs into any of some shared iPads to their specific profile. So the technology for multiple iOS user accounts already exists—just not for families. This solution does require a server, but Apple could build a multiple user management systems into HomeKit, for example, which allows you to use an iPad, Apple TV, or HomePod as a home hub. I am not convinced that many US families have an Apple TV or would be willing to set up a home server as a solution. For some people, the iPad is the only computer they own. I am also sceptical that Apple TV has the CPU requirements to act as a server in this way. We don’t know the criteria for educational servers. That is a needlessly complicated and possibly expensive solution compared to just “buying another iPad”. I am not arguing that having multiple accounts on a single iPad is not desirable. I think the geek=centric solutions laid out in the Intego article are not **practical** consumer-friendly solutions in 2019 and perhaps for the near term. An [1TB 11″ iPad Pro](https://www.apple.com/shop/buy-ipad/ipad-pro/11-inch-display-1tb-space-gray-wifi) $1,549.00. A family can purchase three [128GB 11″ iPad’s](https://www.apple.com/shop/buy-ipad/ipad-9-7/128gb-space-gray-wifi) for less than that. With a slightly larger budget of $1,765.71, a family of four and have two 128GB 11″ iPads and two 64GB iPad mini. Which is better in a family? Fighting over who turns it is to use the multi-user iPad or each person having their own? I have two nieces, and two nephews, and two kids of my own. The argument who over who’s turn it is to use the family computer is endless. I have seen the “winner” being hit with the iPad by the “loser” and the tug of war for the iPad leading to a smashed device. I was privileged to buy each of my kids their own iPads (actually one hand me down iPad, and one purchased iPad Air) and save my sanity. I agree that not every family can afford to purchse ,ore than one iPad. But buyign more Apple equipment (Apple TV or mac based homekit server) are low-budget solutions. When designing solutions for human beings we need to think about how human beings actually live with technology. I’ll lay out a scenario. “Person A” sees those “What’s a computer?” commercials on TV. Decides that they want an iPad. It’s the only computer they will own. They head into the Apple Store and after consulting with an Apple Genious walks out with a suitable iPad. They get used to it and love the device because of how simple it is to use. They just pick it up and FaceID or TouchID just magically unlocks the device. The person gets into a serious relationship with “Person B”. Person B wants to use Person A’s iPad. However, Person A has sensitive files etc. they are not ready to share with Person B. They attempt to use the “multiple accounts” feature. Is the iPad that was purchased capable of doing multiple accounts? Does it have enough memory? Does the “multiple account” feature need additional hardware or services purchases from Apple? What is the cost of that? That simple device has now become more complicated. Is that what consumers want? If you look at your iPad’s storage, you’ll no doubt see a lot of “other” space that can be reclaimed. If there were multiple accounts, there wouldn’t be much storage for settings and app space, but it could be a problem for photos and media. 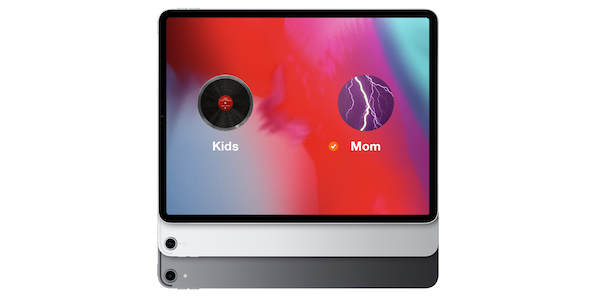 In the example we discuss of wanting to let a kid access an iPad without risking your personal data, there probably wouldn’t be much of an issue with storage, but it is certainly something to be aware of. So there would have to be a compromise, perhaps where only one account can add a lot of content.